You or your child will follow cognitive tasks on the computer screen, and will need to respond to these activities according to the instructions using the keyboard. Each level presents different challenges for enhancing specific cognitive skills . There are 36 levels all together and the user is tested for how well and how fast he/she responds. The program is language independent and is designed so that the brain can easily generalize the skills developed during practice, even if it never worked properly before, as is the case with attention deficit disorders (ADD, ADHD) and learning disabilities (LD). The program teaches the brain how to produce focus, and in time these changes consolidate and become automatic. The motivation is to improve the scores. Such improvement directly correlates to improvement in cognitive performance. 1. Calm: Allows the mind to relax and get ready for a task; important for contemplation and planning. 2. Focused: Allows attention to a specific task; offsets distractions. 3. Alert: Allows fast response when quick a reaction is required. In addition, as explained earlier, the program works on a long list of cognitive skills and abilities. One of the most powerful features of SharperBrain™ is that it replicates real life environments (for instance, a classroom including all of the distractions) but on the most fundamental level. This is one of the reasons why the program can actually correct attention deficit related problems so effectively and relatively quickly. The program also has a sophisticated system that shows graphs and stats about the user's performance. It will point out problematic areas and show ongoing progress. After you purchase the program, you will receive an actual CD with a detailed user manual plus unlimited technical and professional support at no extra charge. We want to make sure that you or your child get the maximum out of the program. "Support and Follow Through are Quite Remarkable!" I really hesitated before buying, because I was concerned about support here in Australia. I am glad I gave you guys a chance. Your support and follow through are quite remarkable and the suggestion you gave me really worked. According to Sarah (note: Sarah is Darlene's 9 year old daughter) playing the piano has become easier since she started on the SharperBrain. She has even improved in math. We have been all surprised at her progress in school. Most of her ADHD symptoms have improved. I would like to start my son Carl on the program. He suffers from Dyslexia and learning disabilities. We hope you have been following the latest news on the side effects of attention deficit related medication. Ritalin can cause chromosome abnormalities. Adderall can cause death and has been banned in Canada as a result. Testing Ritalin in animals showed that they exhibited evidence of dysfunctional brains after consuming certain amounts of the medication. The FDA has lately asked the manufacturer of Strattera to add a bolded warning about the possibility of severe liver injury, to the label. A Food and Drug Administration panel recommended that the agency move forward with plans to rewrite labels for Concerta, Ritalin and other drugs widely used to treat attention deficit hyperactivity disorder to more clearly warn of the possibility of hallucinations and suicidal tendencies in patients taking the drugs. Until now there was no real alternative, but now there are no more excuses. 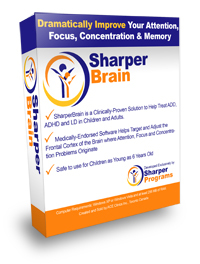 SharperBrain™ is offering a real solution that is drug-free and side effect free. 2 weeks on the program and you will understand why we are so proud of it. "From 52% to 78% in Less than a Month! " My son improved his scores from an average of 52% to 78% in less than a month. There is a noticeable improvement in his ability to concentrate in class, even his teacher noticed that. Click Here to Order SharperBrain! SharperMemory™ focuses on enhancing all aspects of memory and is recommended for people who have become forgetful as a result of aging or injury . It is also excellent for those who would really like to tone their memory muscles even if they don't have a specific problem. SharperMemory™ has also been found very effective in improving learning difficulties associated with LD. If you would like to work with both programs, we will guide you on how to combine practice for best results. You Don't Have to Live with Memory Loss any Longer! For years, older people were forced to resort to "tricks" to help them remember things. Sticky-notes, to-do lists, personal organizers and puzzle games were all devices used to try and help you recall things easily - just as you had always done in the past. But even these things can't keep your memory from slipping away. What if, instead of just slowing the progression of memory loss - you could actually stop - and reverse it at the same time? "My Ability to Remember Has Dramatically Improved!" Since the accident my memory and concentration were awful. I started using SharperBrain and SharperMemory a month ago. Since then my ability to concentrate and remember names, numbers, etc. dramatically improved. You don't have to live with memory loss anymore! In fact, in every instance of working with patients and users with the above conditions - every single one of them showed a remarkable improvement! And SharperMemory is Easy to Use! Using SharperMemory on your computer actually helps reverse, repair and restore your natural brain function in the area of the brain where both long-term memory and short-term recall activities take place. It's fun and rewarding to use - but extremely powerful in the results it delivers in just a short amount of time. No matter how bad your memory is now, SharperMemory can make it what it used to be - and so much more. Just 20 minutes a day, 3-4 times a week is all you need to experience a dramatic memory recovery. No pills, no side effects - just real life results. Don't just cope with a memory deficiency - conquer it! Order SharperMemory now and watch as your memory practically mends itself! Get the Facts on Memory Loss Prevention Now! Learn more about how aging affects the brain and contributes to memory loss - and how SharperMemory can help reverse the process. Visit our case studies page and find out how participants did on recall and concentration tests when using SharperMemory. This is the proof you've been looking for! For patients or family struggling with MCI - you no longer have to watch as your loved ones' memory and ability to do everyday tasks slips away before your eyes. Learn how SharperMemory can help reverse and repair memory loss. Just want to be smarter and recall things faster? Even if you're not experiencing memory problems now - you can help train your brain for peak performance! Great for students with test anxiety or just to give yourself that "edge" you need to succeed in learning, sports and life!